Poisoning the Well is an attempt to bias an audience’s opinion before an opponent has had a chance to state their case. This practice comes in a variety of flavors, and not tasty ones like guava or mango, probably most often taking the form of an ‘Ad-Hominem’ attack. 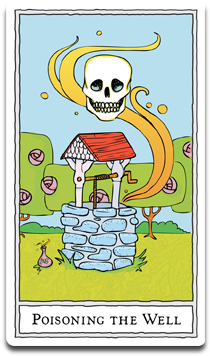 Poisoning the Well is done in order to call into question any later statements from the opponent. Haha, this always conjures a scene in my head of old-time politicians debating. They excoriate each other and misrepresent the other’s positions, punctuated by ironic references to each other as “my esteemed colleague”. Isn’t this more of a rhetorical device than a fallacy? A person can poison the well by employing a fallacy, but I think that poisoning the well, per se, is not necessarily fallacious. Regardless, it is definitely something that subverts reasoned discourse, plus the card is very cool. Just remembered Ronald Reagan’s famous bon mot during the presidential debate of 1984. In reference to Walter Mondale, he said: “I won’t hold my opponent’s youth and inexperience against him.” One of the more gentlemanly, yet very effective, examples of PTW. That example is great! Mind if I incorporate it? As far as the definition of ‘fallacy’. There will be many things eventually posted on the site that won’t technically be fallacies, as in faulty reasoning. I’m planning on doing a post where I hope to better explain how things roughly break down as well as better define the scope of the site. Eventually, there will be fallacies, biases, booby traps, blind spots, and a some other that I hope elegantly expose gaps in human logic/reasoning. Yeah, definitely feel free to use it! I like the idea of including more than just fallacies. So many, interesting and infuriating things that people do, consciously or not, during discussions about issues. I’m looking forward to uncovering some that I inadvertently do. It’s generally considered an informal fallacy. Many of the informal fallacies are also used as rhetorical devices. This doesn’t make them any less essential to the instruction of critical thinking, or any less difficult for students to understand and remember. To that end, they are usually covered in logic courses and textbooks, and given the same level of importance as the formal fallacies. I’m really glad to see these cards taking shape, and I’m looking forward to them being released. If they are as good as I think they are going to be, I’m hoping to include them in the required materials of my (far) future introductory logic courses. That’s really good to hear! I am planning on doing a post and include in the booklet a breakdown of the difference between formal and informal fallacies, there are also a few other cards planned that won’t be either and just prime examples of how our brains can fail us.